Adjust your position, with one smooth motion. Simply lift the work surface up to 17.7â€ (450 mm), to elevate both your monitor and keyboard. You can adjust the tension to your own preference. The monitor mount has a separate height adjustment of up to 4.9" (124 mm) along the column. This sit-stand monitor arm supports one monitor up to 24â€. The swing arm swivels from -90Â° to 90Â° and tilts from -30Â° to 65Â° for ideal viewing. The VESA mount also rotates up to 360Â° for portrait or landscape orientation. 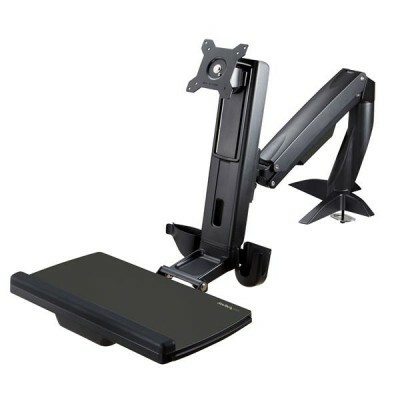 The monitor arm features a large keyboard tray (17.68 x 8.15â€/ 449 x 207 mm) with ample working space. A slide-out tray (8.5 x 8.4" / 217 x 213 mm) holds your mouse, on the left or right. To make the most of your workspace, you can tuck the monitor arm away when itâ€™s not in use, to free up space. The keyboard tray also folds up to 90Â°.